Jonathan Frid was born December 2, 1924, in Hamilton, Ontario, Canada. 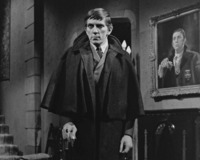 He was a trained Shakespearean stage actor, but would have lived and died unknown to all but family and close friends, but for a call his starring role as the darkly debonaire vampire Barnabas Collins on the TV soap opera Dark Shadows. Frid died in the early morning hours of Saturday, April 14, before Tim Burton’s Dark Shadows remake, in which Frid had a cameo appearance, was released. Depp grew up as an ardent fan of Dark Shadows and that passion led to the film version remake, which premiered May 11, 2012, with Depp as a key producer and starring in the role made famous by Frid. Director Tim Burton brought Frid and other original series cast members in for cameos in the movie, giving Depp a chance to share the screen with an idol of his youth. In a conversation that stretched over a series of emails, Depp said it was clear last on the London set of the Dark Shadows film that Frid had reached a fragile time in his life. “Very sad,” Depp said of the news of Frid’s passing in a hospital in his hometown of Hamilton. Source: Geoff Boucher, Los Angeles Hero Complex. Note: This, of course, begs the questions: Why did Depp’s “Barnabas” look and act more like Michael Jackson than the “elegant and magical” Jonathan Frid? Either Depp didn’t borrow enough of Frid’s “gestures and phrases,” or he isn’t much of an actor! Lee, I think that the answer to your question is that Depp isn't much of an actor. He "gays up" everything he does. I told all of you that he would gay up the role of Barnabas, but none of you believed me until you saw him in his Michael Jackson costume! It's not that we didn't believe you. We, or at least I, thought that because both Depp and Tim Burton were Dark Shadows fans, that they would try to do it justice. I was shocked when I saw those first pictures of Depp in his Michael Jackson get-up and those nails, Ughh! He looked more like a cartoon character than a person. Yes, Jason, you were right, he "gayed" it up! "It's not that we didn't believe you. We, or at least I, thought that because both Depp and Tim Burton were Dark Shadows fans, that they would try to do it justice." Huh? If that wasn't disbelieving me, what would you call it? Well, excuse me, Jason! What I meant was that I believed you when you said that he would "gay it up," but I HOPED that because he and Burton were DS fans, that they wouldn't ruin it! He "gays up" everything, so that was a given. BTW, you couldn't have chosen a more appropriate avatar!